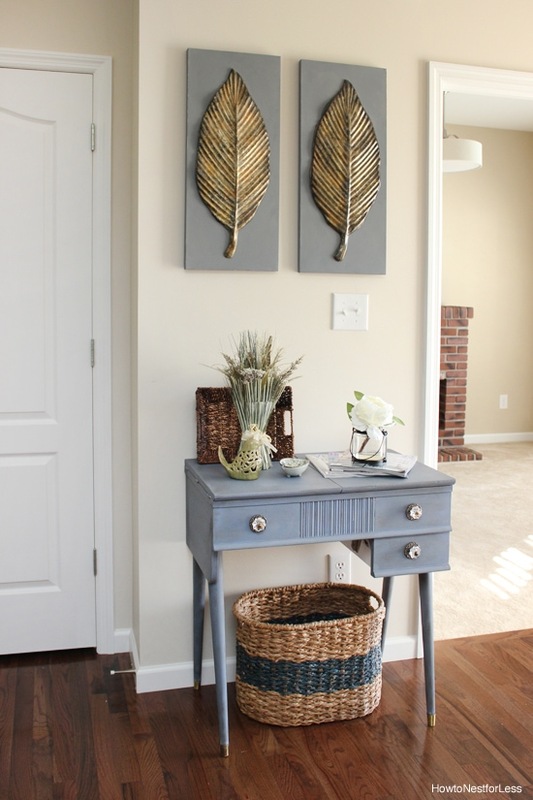 This post is sponsored by Chalk Paint® decorative paint by Annie Sloan. All opinions are 100% mine. It was a crazy busy weekend in our house. Finally got our backsplash installed, made some exciting changes to our sun room, and painted a beautiful new piece. Well, not new… it used to be our kitchen landing table. I think with the new white subway tile backsplash and our white kitchen cabinets I needed a little bit of color in my life. So the old table got a new coat of paint. 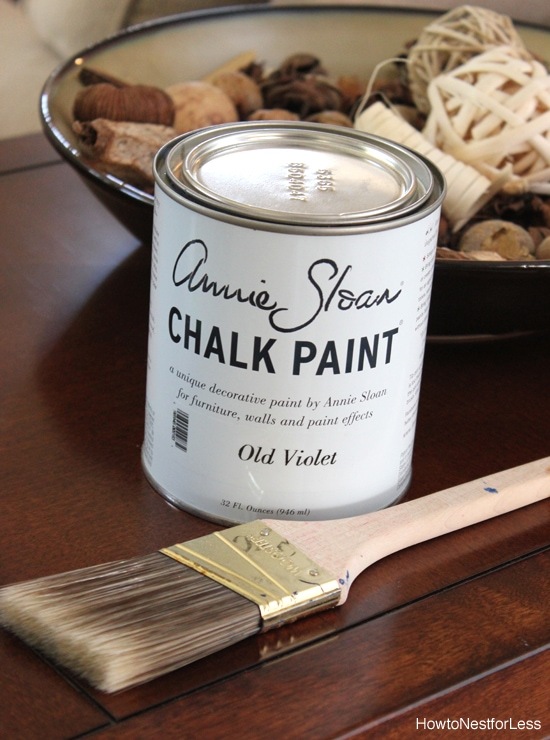 I used Chalk Paint® decorative paint by Annie Sloan in the color Old Violet. I think this is my new favorite color. It complements my family room and sun room perfectly. I actually thought Old Violet would have strong purple tones, but it actually has a blue gray feel to it. So I painted the entire table with Chalk Paint®. 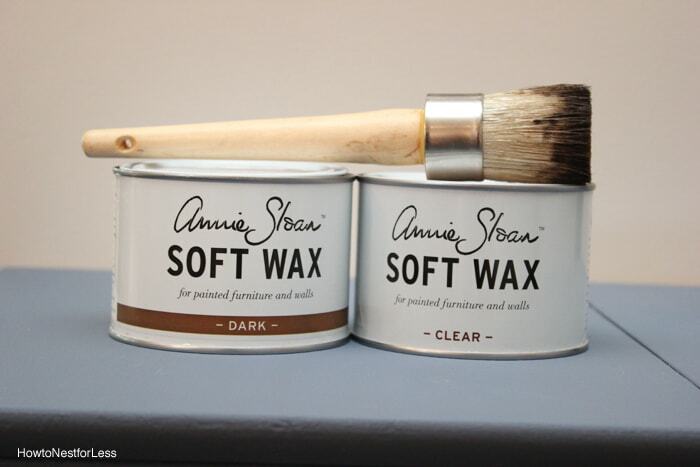 Then it was time to decide on the Annie Sloan Soft Wax. Dark, clear, or a mixture of both? To help decide, I painted a scrap piece of wood and tested out the wax. 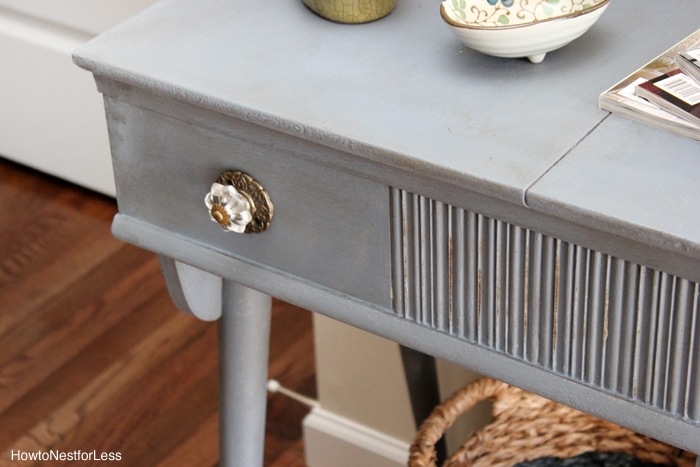 I’m glad I did this because sometimes a clear wax can really change the natural Chalk Paint® color. For Old Violet though it didn’t change the color at all; just added a bit of shine to it. I ultimately decided on dark wax over a coat of clear wax. This gives you the best control over the dark wax. 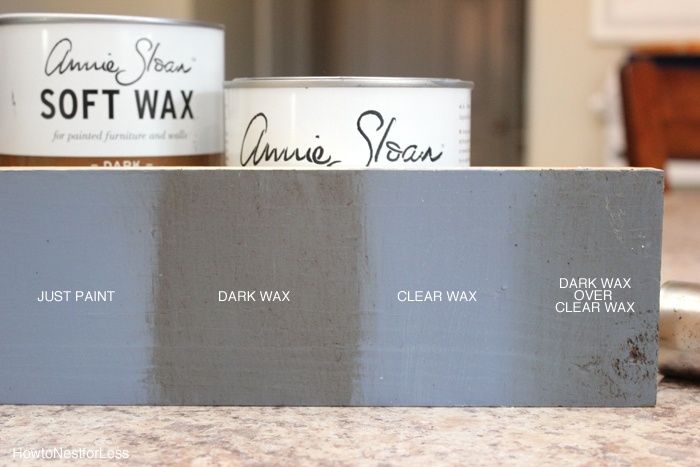 If you only start with dark wax, it’s nearly impossible to scale it back. But if you start with clear wax and then add some dark wax, you have a lot of control over the opacity. I kept the same knobs as before since I’m still crushing on the crystal. 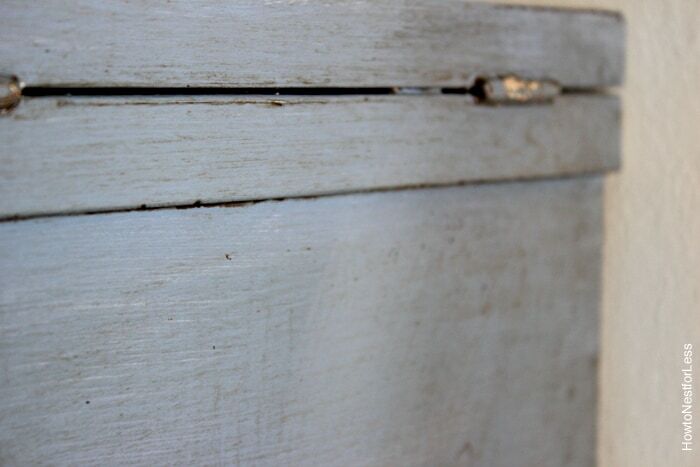 And I just love how the dark wax seeps into the paint crevices. 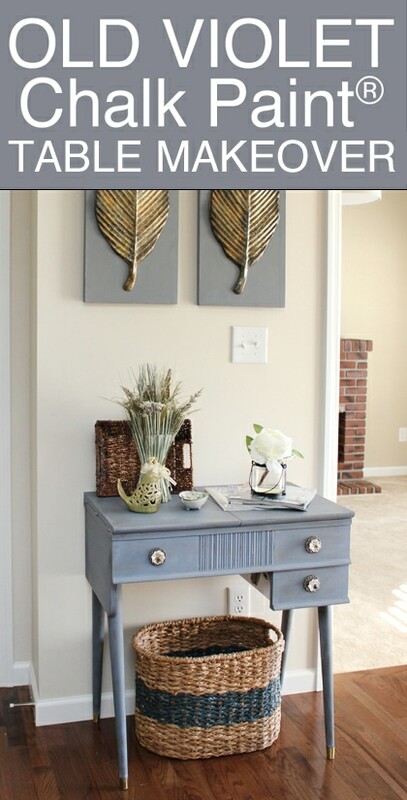 And remember those leafs that I found from Goodwill and painted? Seems to go perfectly with this new color (just a bit more blue). If you want to try some Chalk Paint®, find a Retailer or Stockist. by visiting their Facebook fan page, Twitter, Pinterest and YouTube. 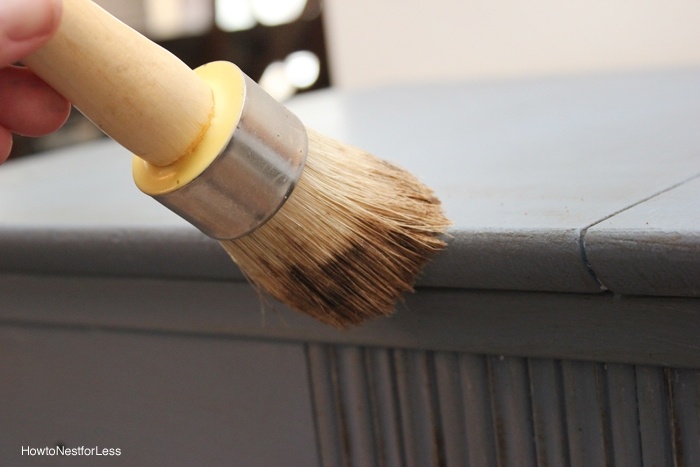 This post is sponsored by Chalk Paint® decorative paint by Annie Sloan. Hi! That table is gorgeous! Great job! 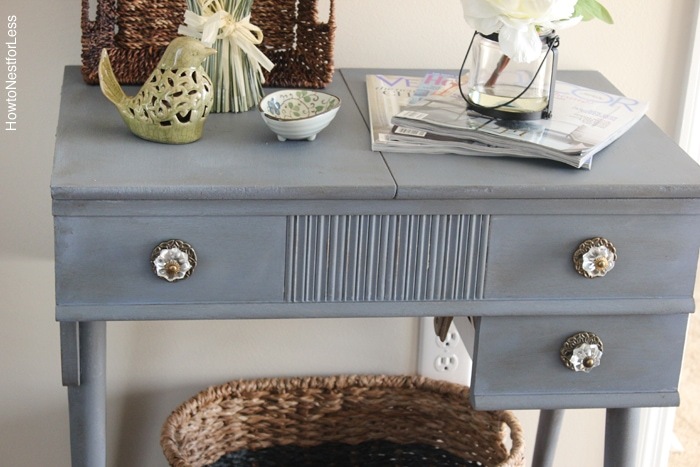 It gives me an idea to paint a vintage victorian hope chest I have and Old Violet is the perfect color! My living room is shabby chic & gray with lavender accents and I can’t wait to get started. I have never done two different color wax coats, so it will be something new for me and I love that! Thank you so much for your blog, I am an avid reader and always get a lot out of what you post. Also, loved those GW gold leaf plaques! Create & Paint on!